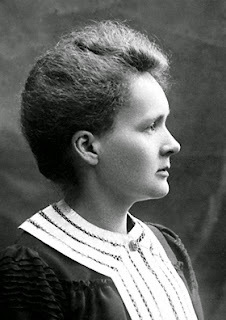 DarwinCatholic: Why Were The Trolls After Marie Curie in 1911? Why Were The Trolls After Marie Curie in 1911? 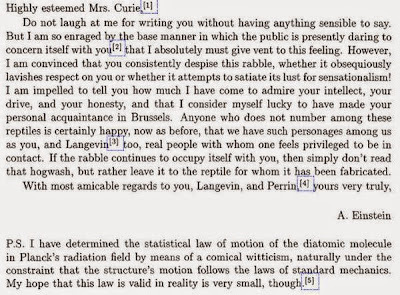 In one of those little bits of history which catches the imagination, Astrobiologist and Sky & Telescope columnist David Grinspoon created something of a social media sensation when he tweeted out the following (translated) letter from Albert Einstein to Marie Curie with the description "Found this in newly released Einstein letters: advice to Marie Curie on ignoring the trolls." We'd all like to think that we're being line famous scientists when we ignore the troll, and it's pretty cool to see a letter which is primarily written to say in a friendly way that you shouldn't let the haters get you down, and then drops in a PS: "I have determined the statistical law of motion of the diatomic molecule in Planck's radiation field by means of a comical witticism, naturally under the constraint that the structure's motion follows the law of standard mechanics. My hope that this law is valid in reality is very small, though." So, yeah, we may all be able to ignore the haters like Einstein and Marie Curie, but we don't generally have that kind of news to pass on in a postscript. But, being the curious fellow that I am, my first question was: Why exactly were the trolls after Marie Curie in 1911? I suspected I had a good idea, but I had to go research around a bit to be sure. To go back a bit: Marie Curie was born Maria Sklodowska, youngest child of two teachers in Warsaw, which was in the Russian-ruled part of Poland. (From 1795 to 1918, Poland ceased to exist as an independent country, having been divided between Prussia, Austria-Hungary and Russia.) Marie showed an early aptitude for math and science but due to family and financial problems (her father at one point lost his job for having Polish nationalist ties which the Russian authorities disapproved of) her serious studies were delayed until she left Poland for Paris, France in 1891. In Paris she dived into scientific pursuits and first met Pierre Curie when she was looking for more lab space and a friend introduced her to him as someone who might have room to spare for her work. They married in 1895. Marie was doing work on what she eventually named radioactivity, and the work eventually interested her husband Pierre sufficiently that he dropped his own work and joined her in hers. Working together, they discovered two new elements (radium and polonium) and did a variety of work relating to radioactivity. In 1903 they received the Nobel Prize in physics for their work. Marie was the first woman to receive a Nobel Prize. In 1906, Pierre was knocked down by a horse-drawn vehicle while crossing the road and killed. As the couple had become famous for their work, the University of Paris had created a chair of physics and given it to Pierre. On his death, the Physics Department decided to give the chair to Marie, thus making her the first female professor at the University of Paris. As such, she was a well known public figure. Using the lab which came with her new position (one which the University had agreed to build for Pierre but had not been finished before his death) she succeeded in isolating pure radium in 1910. However, she was rocked by scandal in 1911 when newspapers broke reports that during the last year she had been conducting an affair with a former student of her late husband's, physicist Paul Langevin (who was himself married, though separated from his wife.) Not only was this seen as deliciously shocking behavior in a woman who had broken so many barriers, but it provided fodder for per-war France's periodic bouts of hysteria over foreigners. It was all very well to claim Curie as French when she was receiving major international awards such as the Novel Prize, but when she was being attacked in the press they suddenly remembered she was actually Polish. However, that same year, the Nobel Committee awarded her a second Nobel Price, this one in Chemistry, for her work on isolating and studying the properties of radium. 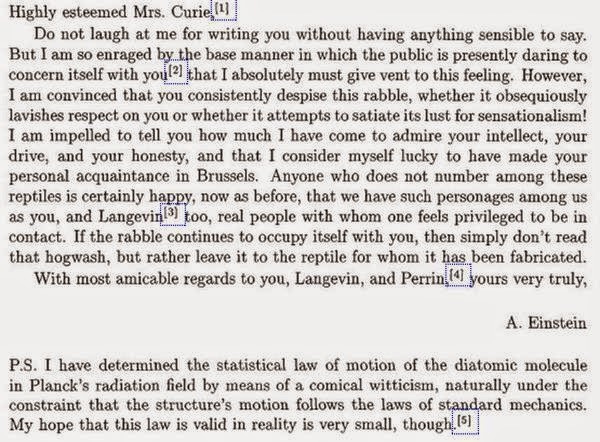 This was the environment in which Einstein wrote to Marie from Prague in 1911 telling her to ignore the rabble with its lust for sensationalism. Marie weathered the storm and went on to lead the Radium Institute, later the Curie Institute, to study radioactivity and related phenomena. When World War One broke out (you knew there had to be a WW1 angle, right?) she became active in the war effort and helped produce mobile radiology units for treating the wounded, as well as working on new medical uses for radioactivity.